For the past three weeks, I’ve held make-up classes in addition to my regular classes, which meant I lectured from Monday to Friday either 5PM to 8PM or 5PM to 9PM. This has been a crazy schedule more so because I’m still maintaining my 8AM-4PM job. Yesterday should have been my last C++ class, however, a few of my students requested that we have an additional class. There are two days next week assigned for revision by the University that I will use to give the students who missed assessments, an opportunity to come to class to submit their work and also review any concepts covered throughout the semester that was not fully understood. Most students are usually happy for classes to end but it felt really great hearing students say I’m their favourite lecturer…not sure if they’re trying to get extra marks lol, request that I teach them other courses as well as ask for an additional class. These are the moments that make lecturing so worth it. It has been stated in many forums that the first 7 years of a child’s life is crucial to the development of their character. Yesterday before my C++ class, I engaged in a bit of conversation with one of my students. He currently lives in an area of the country that is quite known for drug and gang related activities and we were discussing some of the common traits of people within those areas. He has a 2 year old daughter who lives with him and his parents and he wanted to purchase a particular item for her. I mentioned to him that it’s predominantly persons of a particular class who see those things as important and maybe he should reconsider his choice. He agreed that all of the men in his area were purchasing those items for their kids so he saw nothing wrong with it. He also explained that it’s almost impossible for him to have a discussion with his friends in the area about the work he is pursuing at the University as most of them will not even have a clue about anything he is currently studying. It’s as if they see no other way of living than what they’ve been shown. After some persuading on my part, he agreed with what I was trying to say about the choice of item for his daughter. Even though we were born into a particular way of living, it’s important that we constantly try to elevate ourselves and the standards of the generations to come. He mentioned that his goal was to have his own home outside of that area, within the next 5 years. I definitely applaud his efforts as a 26 year old man coming from that part of our country. 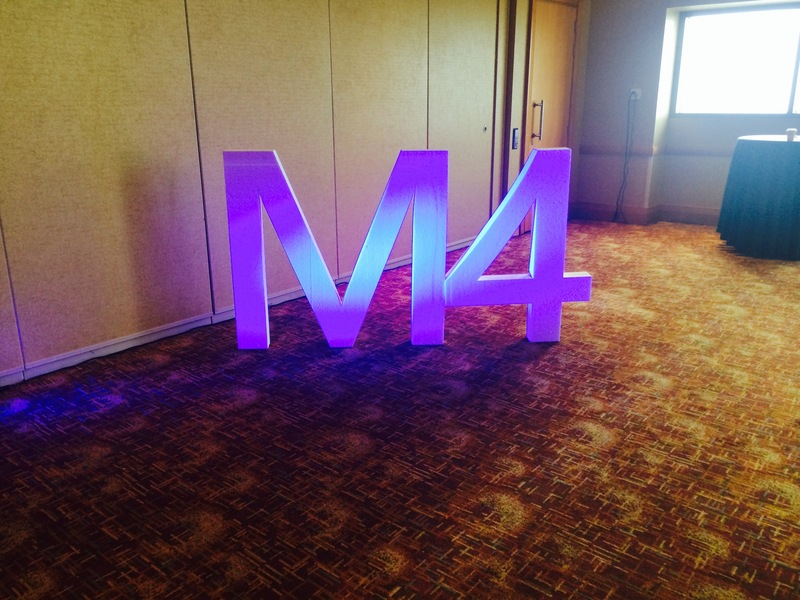 Yesterday I attended Microsoft’s first-ever local conference entitled M4: An Event by Microsoft– Re-imagining Your Business in a Digital World at the Hyatt Regency Trinidad. A major feature of the conference were the 14 speakers who discussed how businesses can be transformed to achieve increased productivity, the use of their data to analyze trends, which would lead to strategic marketing and increased sales as well as operating in a mobile world where employees can use various devices that are integrated for efficiency, all while ensuring the company’s sensitive data is safe and protected. The keynote address, Re-imagining Your Business, was delivered by Mariana Castro, General Manager, LATAM New Markets, who is responsible for the success of Microsoft’s business and partner relationships in this region. Now I’m an Apple girl, so I’m not necessarily buying into all Microsoft’s products but the features of the products and what can be accomplished from the use of them were what I was most interested in. Those benefits can be derived from other applications on other platforms. The fact remains that not all students will respect you. One of my students is usually very grumpy, which is quite sad considering he’s such a young man. He enters the classroom, you smile at him and greet him, he’s upset that you’re smiling at him. It’s always a learning experience for me to meet individuals like this. Yesterday in class he decided to wear headphones while I was lecturing. It’s important that I have my students’ full attention when explaining a new concept and while I tried to get his attention he completely ignored me. Students who usually play this game are seeking attention and desire to feel a sense of power over the lecturer, the environment and the situation. They may have had an upbringing where they were not given much love and attention, they were dominated by another in the household or they have low self esteem and can only feel confident by making others feel bad about themselves. Either way, I was not deeply offended but I did feel sorry for him. This type of behaviour is more common with teenagers, so to find someone in their twenties or possibly thirties behaving this way, it was quite a shock. Yes I will admit it, I try to make things easy for my students to be able to grasp the concepts and for assessment preparation. I think because I have a view of how I would like to learn and how I want to deliver a course, I try to ensure that I cover all three learning styles with my approach to teaching. I send my students video links on the topics covered, extended notes, exercises, powerpoint presentations and sometimes summary notes. The funny thing is that no matter how much information I give to them, some students just would not take advantage of it. I realised this when I started lecturing in 2008. If asked to describe my perfect day, it would not be what I’m doing right now. I am indeed grateful for all my blessings and streams of income but my main 8-4 job is affecting my overall motivation for other work. Where attention goes, energy flows and things grow, so I’m trying my best to make my attention go towards the opportunities I would like to see happen for myself rather than the job I’m currently doing that I will be leaving soon. I have set in my mind that I will be leaving this job at the end of the year and I’m constantly visualising new opportunities and work that I have currently set into motion, that will be finalised and approved in my favour. I remember months ago working for myself from home, earning less income and being so much happier and fulfilled. Passion is an incredible thing. No amount of money can compensate for the joy derived from doing work you’re most passionate about. While my perfect day does not involve life in Trinidad and Tobago, my perfect day while in this country will include me lecturing and having the extra time to work on my business which has hardly gotten any attention from me within the past couple of weeks. Yesterday I received a phone call from a recruiter in the UK who I spoke with a couple times a few weeks ago. It was great chatting with him as his energy always leaves me pumped after our phone calls. He wanted an update on my progress with securing an iOS Developer role in the UK. I updated him on my mom’s health situation and my change in plans. I’m open to remote contract iOS Developer roles but not anything that would require me to relocate anytime soon. During our chat, he asked about my blog and my future intentions for the blog, as we discussed this previously. I’m glad I had this conversation with him. There’s something about someone asking questions about your goals and plans that helps to bring a sense of clarification about the intended process for achievement. If you cannot explain it to someone, you probably don’t have a clear picture in your head. Visualisation is so important when it comes to achieving anything as mental creation precedes physical creation and that which you think about you bring about. I will be using December to make changes to “Help Me Land That Job” to turn in into the resource I would like it to be.